Well, this will be the last post for 2014, and I as I look back over the year, I was able to complete 10 of the 12 UFO's that I set out to finish for 2014. See my completion's here. I used up 123 yards of my stash, but added an additional 89 yards, which gave me a net of only 34 yards used. Hope to do a little better in 2015! This is Lady of Lake Erie, one of the 12 UFOs I have lined up for 2015. You can see all of them here. Yes, more than half of them are Bonnie Hunter patterns. 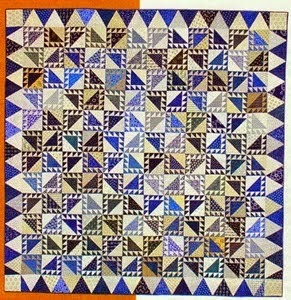 I love her scrap quilts and they are a great way to use up the stash. I will be joining Aunt Marti over at 52 quilts for the 12 in 2015 challenge. Check it out to see if you would like to play along. I hope you all have some great projects lined up for the new year! Your 2015 challenge will go just fine. You picked so many Bonnie Hunter's pattern, They are so time consuming, and you work so many hours through the year. I do believe you will make it this time around. God Bless and have a great year.